This is a full-service registration site that allows each individual or family to make one single reservation. Please be sure to order ALL items — including extra tote bags and meals — before you finalize your order. Meals and additional totes must be purchased by June 1; totes will be delivered to you at the convention. Additional convention souvenir items are available at CafePress http://www.cafepress.com/brat. NOTE! Ladies hoodies and sweatshirts run small. All convention events, including the Thursday night reception, luncheons, Friday night buffet dinner and Fun Night, and Saturday night banquet will be held at the hotel. The hotel is the Holiday Inn Portland-Airport. It is conveniently located 2 miles from the Portland International Airport, just 15 miles east of downtown Portland, with easy access to Interstate 205 and I-84. The hotel has a free shuttle to and from the airport that runs from early morning to late at night. It is a very pet-friendly hotel. Dogs will be allowed in the meeting rooms and there are a lot of grassy areas surrounding the hotel to take your dogs walking. For those flying into the Portland International Airport, the airport code is PDX. Please read the information below about hotel reservations. The hotel is providing a discounted room rate to BRAT Convention attendees of $119 per night, plus tax. Rooms are king or double queen. In addition to the discounted room rate, the hotel is also providing special concessions that include a discounted one-time pet fee of $35 per room (regardless of the number of dogs) and a discounted parking rate of $5 per day. ALERT! Very Important: To get the discount rate, reservations must be made by calling Holiday Inn’s reservations department directly at 503-256-5000 and identifying yourselves with the Basenji Rescue and Transport Convention Block (BRT) or by calling our Group Rooms Coordinator, Maria Hodges at 503-914-5245. If you reserve through Expedia or other online hotel reservation service, you will NOT get the discounted rate and special concessions and BRAT will not get credit for the room for our guaranteed room nights. Rooms must be booked by May 13, 2019 to get this rate. You may also book online through the Holiday Inn's booking link, which is already setup to register you under our discount block code, BRT at https://tinyurl.com/yxwgdmff. Registration entitles you to attend all BRAT activities on Thursday, Friday and Saturday. Meals are additional costs and can be purchased here; this site will walk you through the process. We ask that all attendees register on this site, including those who are not staying at the hotel. Each paid registrant/family receives a free convention tote bag full of goodies. Additional tote bags may be ordered here for $15 each. The Convention is open to all BRAT volunteers, adopters, potential adopters, and BRAT friends. We will provide name badges upon checking in. Your name badge is very important and is your ticket to everything; you will find your meal and event tickets inside your name badge pocket. Please wear name badges at all times — it helps people get to know each other! IMPORTANT reminders before you proceed! You will be making a single reservation for an individual or family. Be sure to order all items you’d like (including extra totes and meals) before you finalize your registration. On Wednesday or Thursday before you check into the hotel, stop by the dog park to let your dogs have a good run. Cully Park is a wonderful new park with a large, securely-fenced off-leash dog park. Cully Park is about 10 minutes from the hotel and is located at 5810 NE 72nd Avenue, Portland, OR (on 72nd Ave., just north of Killingsworth). The park is open from 5:00 a.m. to midnight. Dogs must be current on rabies vaccinations (bring proof of rabies vaccination with you). The park has nice restrooms and parking for about 50 vehicles. On Thursday evening have dinner on your own, but be sure to save room for a complimentary dessert courtesy of BRAT. After dinner, come to the Bridal Veil Hall with your dogs for the reception and early dog registration. Pick up your BRAT welcome bags and name badges. Enjoy some socializing and have lots of fun! Meet everyone and their dogs and put faces to names you only know through Facebook and emails. Renew friendships with BRAT people you have met before. Friday morning and afternoon will be filled with informative seminars and Basenji contests and activities. Afterwards there will be an informal buffet dinner at the hotel followed by a trip to the dog park (weather permitting). We will come back to the hotel for special Fun Night activities. The fun continues on Saturday with more great presentations. We will wrap up on Saturday evening with a banquet, awards, raffles, auctions, and more fun! Generally the festivities on Saturday night conclude about 11:00 p.m. Sunday hotel check-out is recommended to begin your journey home. Check out time is noon. Throughout Friday and Saturday’s lunches and dinners there will be door prize drawings for those who order their meals through the registration site. Everyone registering for the convention will receive an informative email with further details about the event approximately two weeks prior (about June 1st). All times and topics subject to change. 3:15–4:15 p.m. Contests! Costume Contest, Best Baroo, Freckles, Tricks, etc. With recipes and samples for your dogs! Visit the dog park, rest, visit ... whatever. Dogs are welcome at all events. There will be room available for your personal crates and x-pens inside Willamette Hall and they can remain set up throughout the convention. Plastic will be provided to place under all crates. Dogs must be crated or otherwise contained away from eating areas in the room during meals. Dogs cannot stay in meeting rooms overnight. We plan to have a special memorial page in our convention program. If you are interested in including any of your beloved Basenjis who have crossed the Rainbow Bridge, please contact Oren Will at displtxn@aol.com before May 30th. A donation of any amount is suggested, but not required. Go to https://www.basenjirescue.org/donations to donate. A photo is required to be in the Memorial Slide Show. Portland temperatures in June average from a high of 74 to a low of 56 degrees. It's definitely on the milder side during June but it's a good idea to bring an extra layer just in case. Cool, comfortable clothing is recommended for all events including the banquet, which will be casual. Because hotel meeting rooms can be chilly, consider bringing a jacket or sweater — same for evenings in Portland. It's likely to be rainy during the month of June so be sure to bring along a waterproof jacket to stay dry. The hotel is providing a discounted room rate to BRAT Convention attendees of $119 per night, plus tax. Rooms are king or double queen. To get the discount rate, you may reserve by calling our Group Rooms Coordinator, Marissa Hodges at 503-914-5245, or the hotel's main line at 503-256-5000. Be sure to mention block code BRT. You may also book online through the Holiday Inn's booking link, which is already setup to register you under our discount block code, BRT at https://tinyurl.com/yxwgdmff. If you reserve through Expedia or other online hotel reservation service, you will not get the discounted rate and other special concessions (such as the one time $35 pet fee per stay and the discounted $5 a day parking rate) and BRAT will not get credit for the room toward our contractual commitment of guaranteed room nights (see below). NOTE! After you make your reservation with the hotel, you will receive an email confirmation. That confirmation will show the non-discounted pet fee ($35 per day) and non-discounted parking rate ($10 per day). Do not worry. The hotel's automated reservation confirmation program cannot be changed to show our reduced pet fee and parking rate, but rest assured you will only be charged the one-time $35 pet fee and parking at $5 per day! The hotel has set aside a block of rooms at this rate for Wednesday, June 12 through Saturday June 15, 2019. ALERT! Very Important: These rooms will be available at this rate only until MAY 13, 2019, so don't wait, make your reservations today! If you experience any problems with the reservation process, please contact Deb Hughes at basenji.hughes@gmail.com. The host hotel has 284 guestrooms and suites and has newly renovated rooms. Hotel Room Rates: Group rates are good for June 12-15, 2019. The group rate will be honored for three days before and three days after (depending on availability) for those who want to stay longer. Group rate is $119 per night, plus taxes. Group rate includes a discounted on site parking rate of $5 per day. Complimentary hotel shuttle available to and from airport. Runs on demand 24 hours. Dogs are welcome. The hotel restaurant is open for breakfast, lunch, and dinner from 6:00 a.m. to 9:00 p.m. The Cocktail lounge is open from 11:30 a.m. to 11:00 p.m. Try your luck at the video poker room in the cocktail lounge. There is a heated salt water indoor pool and 24-hour fitness facilities. There is complimentary Wi-Fi in all guestrooms and public areas. 24-hour access to business service center. Newly renovated rooms featuring pillow top beds with triple sheets and modern furnishings. The hotel is pet friendly. Find details on their policies below. Pet fee is $35 per stay regardless of how many dogs in room. Tell the hotel at check-in if you do not have dogs. Dogs must be crated when alone in individual hotel rooms. Plastic will be provided in welcome bags. Please place it under all crates in your hotel room. Additional plastic is available in the meeting room. Doggie bags will be provided by BRAT at the registration table. Please clean up after dogs in all areas of hotel, inside and out. Leashes required in all public areas. Dogs are allowed in the meeting rooms at all times, but are to be crated during meals. Dogs are not allowed in the restaurant, gym or pool area. There are poop bags and disposal cans available around the outside areas. We hope everyone who attends the convention will be able to stay at the hotel. 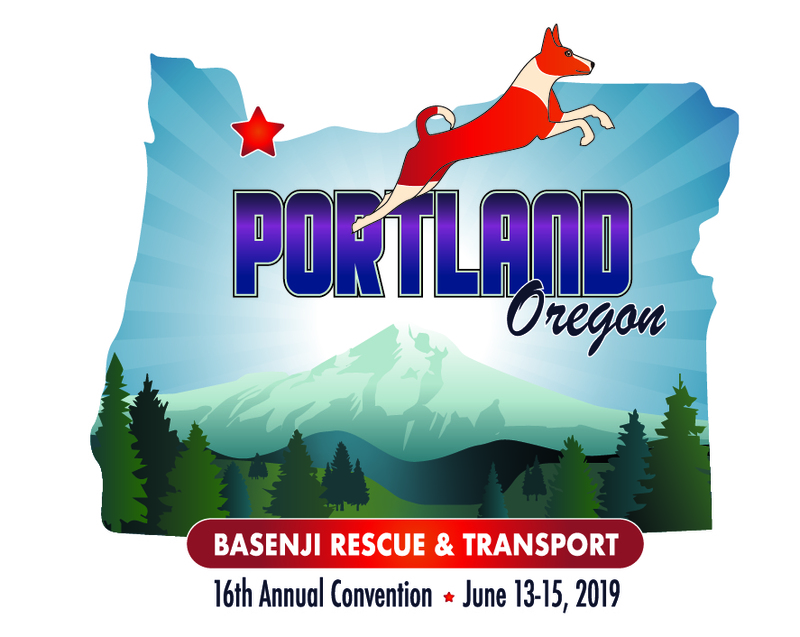 It is a great opportunity to hang out and socialize with fellow Basenji lovers and their dogs in between the convention events. In addition, it helps BRAT put on the convention. The hotel provides the meeting space at a reduced fee and discounts the room rate in exchange for our agreement guaranteeing that we meet our room block. If we do not have as many rooms rented at the hotel as we guaranteed, we have to pay even more for the meeting rooms as a penalty. The same is true for the meals for the event — we are committed to a minimum amount of meals. If we don't meet the minimums for food and beverages, we still have to pay the guaranteed amount. As a result, we negotiated the room block, rate, and food as shrewdly as we could for the benefit of our attendees and BRAT. Columbia River RV Park, 10649 NE 13th Ave, Portland, OR 97211. Located six miles from the hotel. Phone: 888-366-7725 OR 503-285-1515. Website: http://www.columbiariverrv.com. Jantzen Beach RV Park, 1503 N Hayden Island Dr, Portland, OR 97217. Located eight miles from the hotel. Phone: 800-443-7248 or 503-289-7626. Email: mail@jbrv.com. Website: http://www.jantzenbeachrv.com. Sandy Riverfront RV Resort, 1097 E Historic Columbia River Hwy, Troutdale, OR 97060. Located 12 miles from the hotel. Phone: 503-665-6722. Email: info@sandyrv.com. Website: http://sandyrv.com. Crown Point RV Park, 37000 E Historic Columbia River Hwy, Corbett, OR 97019. Seventeen miles from the hotel. Phone: 503-695-5207. Website: http://crownpointrvpark.com. Reeder Beach RV Park, 26048 NW Reeder Rd, Portland, OR. Located 22 miles from the hotel. Phone: 503-621-3970. Website: http://www.reederbeach.com. For a full list of RV possibilities, contact Deb Hughes at basenji.hughes@gmail.com. Cully Park is about 10 minutes from the hotel and has a nice, securely-fenced off-leash dog park. Restrooms are available and there is ample parking. For the sake of all dogs and people, dogs must be up to date on vaccinations including rabies and free of worms and fleas. Dogs (and children) must be accompanied by adults at all times. Before you leave home, be sure to bring your dogs’ appropriate tags, licenses, and paperwork — not just for the dog park — but in case you have to produce them for any reason! NOTE! A map to the dog park will be emailed to all who register. Veterinary services will be available at a local vet near the hotel (to be announced). For after-hours emergencies, DoveLewis Emergency Vet Hospital at 1945 NW Pettygrove St., Portland, OR 97209 is within a 20 minute drive from the hotel. We look forward to some great meals together! Due to many factors beyond our control and the higher cost of living in the area, meal prices are slightly higher this year. BRAT always tries to keep prices as reasonable as possible. Holiday Inn adds on a 23.5% service charge/facility fee to all meals; the price for all meals includes these tips, taxes and fees. Yes, we know you can go to McDonalds or other fast food places for less. But outside food is not allowed in the meeting rooms, so think of the great company you will miss if you leave us to eat! 100% of meal prices collected go directly to hotel. BRAT makes no profit on meal charges. You will order your meals through this registration site. Meals may be ordered now through June 1, 2019. All meals include water and a beverage. We encourage you to attend all the meals to meet others, develop networking contacts and discuss all the information you'll be receiving. It is a time of sharing and fellowship — with a fresh, plated, individually served meal or buffet right in the room you've been enjoying. There are four additional incentives to join us for both lunches and dinners as each will feature a door prize drawing for those who purchased meals and are in attendance. ALERT! Very Important: It is very important that you eat the specific lunch or dinner that you ordered. Meals must be ordered in advance through this registration site. Please place your meal card on the table for each pre-ordered lunch or dinner to facilitate meal service. Pre-ordered/pre-paid lunch, dinner buffet, and banquet tickets will be in your ID badge pocket. Please be sure to bring your tickets with you to all meals. Lunches include water or soda, pasta salad, chips, cookie; tax and tip is included in the price. No need to choose; all selections will be on the buffet table. Yum! No need to choose; all selections will be on the buffet table. Tax and tip is included in the price. Important dates you need to put on your calender! ALERT! Very Important: Do not wait to register for the hotel rooms! We have only one block of rooms reserved and rooms fill up very quickly. Below is a list of local activities you are sure to enjoy. REMINDER: If you’re bringing the canines, don't forget your clean up bags! Any and all questions will be happily answered by our convention organizer, Deborah Hughes at basenji.hughes@gmail.com. All rights reserved © 2019 Basenji Rescue and Transport, Inc.